(Bloomberg) -- Amazon.com Inc. won the last approval it was seeking for an incentive plan that helped lure the largest online retailer to Northern Virginia. The five-member Arlington County Board on Saturday unanimously approved $23 million in incentives for the company to build a headquarters in the Crystal City neighborhood, just outside Washington, D.C. -- after six-and-a-half hours of testimony, protests and discussions by more than 100 people who argued for and against the deal. 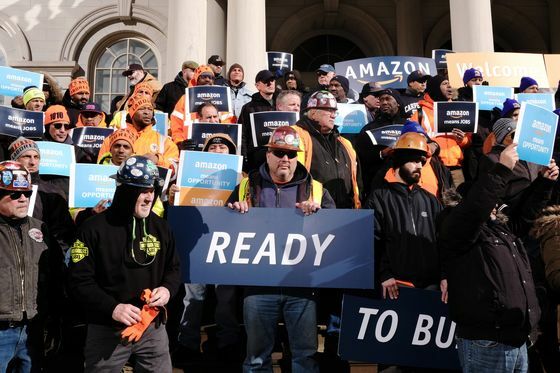 While localities vied for Amazon’s attention, activists organized against the company -- complaining about subsidies, and arguing its presence would increase housing costs and worsen congestion. The company announced in mid-November it would split the headquarters between Northern Virginia and New York -- the location it later scrapped -- and add jobs in Nashville as well. In Arlington, Amazon plans to locate in properties controlled by JBG Smith.